Ottawa’s weekly grain targets won’t necessarily guarantee that the right grain is moved at the right time to the right location, say critics. Beginning next week, Canada’s major railway companies will be obligated to move a combined total of one million tonnes of prairie grain per week, which is the equivalent of 5,500 loaded hopper cars each, or face fines as high as $100,000 per day. The targets were part of a federal order that was implemented in early March in hopes of increasing the flow of prairie grain to domestic and foreign markets. Canadian National Railway and Canadian Pacific Railway were given four weeks to ramp up operations to meet the targets. The four-week grace period ends in early April, but there are already signs that the targets, despite moving greater volumes, will do nothing to ensure the smooth flow of grain from country elevators to end users. Grain industry observers say there is no guarantee that the grain arriving at port is the grain that’s required to fill sales orders. According to some industry groups, railway companies that face fines as high as $100,000 per day for non-compliance will be less inclined to provide service to elevators in more remote areas, where car cycle times are higher. 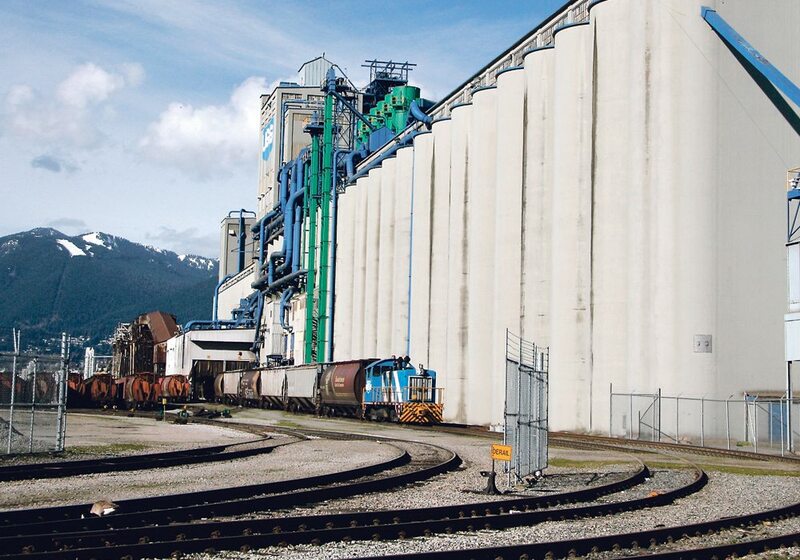 More likely, volume targets will encourage railways to haul as much grain as possible over the shortest distance possible, which could have negative implications for some shippers and producers. A grain logistics expert with GNP Grain Source Group in Calgary told the Grain Handling and Transportation Summit held in Saskatoon last week that the order in which grain arrives at port is critically important. “What we’re seeing now is a bit of a situation where grain is arriving really not in the sequence that the terminals would like to see,” said GNP general manager Perry Pellerin. Pellerin, whose company provides grain logistics services to four independent, farmer-owned grain terminals in Western Canada, said logistics co-ordination is just as important as volume. “I compare it to … a situation (where you’re) … building a house … and before you even dig the basement, the plumber arrives with the bathtub and says where do you want it … and by the way, you’re on demurrage,” he said. Pellerin conceded that imposing minimum weekly grain targets has the potential, in some cases, to make an already messy situation even worse. However, he stopped short of saying the weekly targets were counter productive. Federal agriculture minister Gerry Ritz offered a similar assessment of the weekly targets at a March 27 news conference in Saskatoon, suggesting the government’s primary objective was to get grain moving. Legislation tabled last week in the House of Commons will extend the weekly targets to the end of the 2013-14 crop year and require railway companies to submit additional information so Ottawa and grain shippers have a better idea how much grain is moving through each rail corridor and to each port location. “The order in council is a bit of a blunt instrument, just to get volumes moving,” Ritz said. Ottawa is not inclined to get involved in co-ordinating grain logistics by re-establishing a central logistics agency, similar to the former Grain Transportation Agency, he added. Ottawa’s proposed rail bill, the Fair Rail for Grain Farmers Act, gives the strongest indication yet that the Conservative government is prepared to take steps to ensure that service level agreements contain reciprocal penalties. Under Bill C-52, the Fair Rail Freight Service Act, which was passed last year, shippers and railways companies that fail to negotiate service level agreements can ask the Canada Transportation Agency to arbitrate an agreement. However, under that act, CTA arbitrators do not have the authority to include financial penalties in their arbitration. It is widely believed that Ottawa’s new rail legislation, unveiled last week, will expand the CTA’s authority to include reciprocal penalties in arbitrated service level agreements, which grain shippers have been requesting for some time. Last week, after meeting with Ritz to discuss the proposed legislation, Saskatchewan agriculture minister Lyle Stewart said he felt reasonably assured that Ottawa would support the notion of using arbitrated financial penalties to backstop the SLA negotiation process.